Nostalgia is a funny by-product of age. From time to time and more and more often as I get older, something will unexpectedly remind me of things – mostly nice things – from the past. Sometimes it’s a KFC. 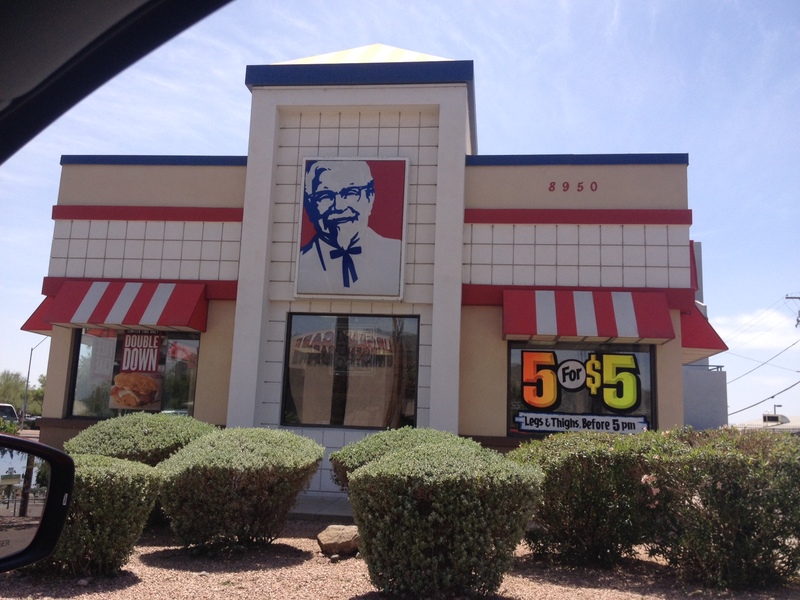 I was in my hometown of Phoenix this past weekend and happened to go past this KFC, continued driving for a block or two, made a U-turn, pulled into the parking lot and shot this picture. Why? Nostalgia, of course. And not nostalgia for KFC in general – although I’ve been secretly craving the new Double Down and don’t understand why the twitterverse isn’t up in arms that it’s back for a limited time only – but nostalgia for this KFC in particular because when I was fifteen-ish, I spent a lot of time inside this KFC. Why? A girl, of course. Nostalgia is fuzzier than memories and the details now elude me. Her name was Cathy although I can’t remember if it started with a “C” or a “K.” I for sure have no idea what her last name was. She could drive and I couldn’t, so she was older than me but not by much. I can’t remember how we met either. She was poor and didn’t go to my high school. We didn’t have any friends in common. I don’t recall ever meeting her parents or whether they were married or divorced. But she worked at the KFC so maybe I went in one day and ordered a three-piece meal, original recipe not extra crispy, and we hit it off. It doesn’t matter. Whatever the impetus, for a year (or maybe it was just a summer) back in the ‘80s, we were inseparable although the particulars of what we did are as unclear as the details of how we met. She had a boyfriend who was senior at her high school, so we never dated although I’m sure we made out once or twice. I vaguely remember listening to a lot of Billy Squier and clearly remember sitting on the roof of my dad’s 1967 Buick late one summer night looking for shooting stars. I know I loved that moment and I wish I had a recording of the conversation. As with most relationships at that age, we drifted apart as high school rolled on. I think she dropped out and had her own apartment by the time she was 17. The last time I saw her was at her wedding when I was 19 or 20. I remember Italian food, getting to dance with her briefly and her looking very happy. I never saw her again. Until I drove by the KFC the other day, I hadn’t really thought about Cathy (or Kathy) in over 20 years. Nonetheless, dipping my toe in the ’80s end of the pool was a happy trip down memory lane to visit fifteen year old me. One of the mixed blessings of being fifteen is the conviction that nothing like this, all evidence to the contrary notwithstanding, has every happened to anyone before. The passage of time may have changed my perspective, but at least in this case looking back was all good. Unfortunately, I can’t say the same for Guard of Honor by James Cozzens, the Pulitzer Prize winner from 1949. When I originally went to Amazon to buy this book, it was out of print. I was more than a little puzzled as to how a once-critically-acclaimed novel, if not a popular one, could fall so out of disfavor that it wasn’t even worth printing. Then I read it. If you’re a person that likes to skip to the chase, there were about 10 pages in this 600-plus page book that I didn’t hate. And I was probably in an Ambien haze when I read those. Skip Chasers (or Chase Skippers?) can stop reading. For those looking for a little more snarkiness, I’m glad you’re still with me. The entire story is set on a fictional United States Army base in central Florida and takes place over a three-day period during World War II. There are no chapters. Instead, the novel is divided into three large sections aptly named: Thursday, Friday, and Saturday. Judging from the memorandums that appear throughout the story, the days in question are September 2nd, 3rd, and 4th of 1943. It doesn’t matter. Despite its significant size, only three things happen in this book. The first involves a white officer punching an African-American pilot. This sets up event two, where other African-American pilots protest the use of segregated officer clubs, and the leadership debates appropriate action. Finally, during day three, there is a mass training exercise in which seven equipment-laden soldiers accidentally parachute into a lake, sink to the bottom, and drown. The last incident, incidentally, has nothing to do with anything, and the total pages used to actually tell those stories was less than ten percent of the book. The other ninety percent was mindless description of life on the base using military terms that I was completely unfamiliar with and inane dialogue (e.g., “’Oh, Judge!’ General Beal said. ‘That boy is a honey! You can believe me. Because we have a few more like him we’re going to win the war.'”). But maybe the most annoying thing about the novel was Cozzens’ decision to further confuse the reader by introducing at least twenty characters, none of which could be considered the main character, and all of which were referred to only by rank and last name which made it virtually impossible to keep them straight. I spent most of this book trying to figure out which character committed suicide, an event that took place in the first forty pages. I never did figure it out. I’m almost done. But if you need any more, it’s not only boring, it is hard to read. Cozzens’ writing is filled with rhetorical questions, double negatives, disorientating descriptions, esoteric words, and equivocal pronouns. I had to constantly re-read sentences to ascertain, for example, what part of which abstract idea the pronoun “this” referred to. I found myself constantly drifting, which required me to re-read paragraphs, if not pages. In short, I’ve got two words for Guard of Honor. Pain. Ful. Sometimes, nostalgia gives you the warm fuzzies. But other times, you look back and realize you simply made a mistake and cringe a little. This book falls in the latter category.